Judging by the onslaught of advertisement for genealogy kits, quick tests to find out one’s genetic heritage, there is a rapidly growing market for selling and buying knowledge of our heritage. Of course, many of us have grown up with stories of family history: Grandparents talking about the struggles of their lifetime, parents reminiscing about holidays when they were little, and even stories of our own – the first love, the last cigarette, and the latest conference trip to Europe. Beyond our immediate memory, however, few families (at least in Germany) record their history in writing. Maybe they keep letters and postcards, perhaps some aunt or uncle keeps a record of a near-mythical great-grandmother born in the mid-nineteenth century, but on average it would be hard to find anyone with complete knowledge of their ancestral history. In America, the situation looks slightly different, at least judging from several encounters and conversations I have had over the years across the United States. Here, many people will refer to a specific ancestor from a long-gone century that crossed the oceans to come to the young United States (or the British colonies). They can also add an exact description of their genetic ancestry. More than once, I saw faces light up with delight when I answered the question of my nationality with “German,” only eclipsed by the heartfelt joy in explaining to me that they, too, were “German.” In a few cases, people I talked to were even able to tell me about the very German ancestor who had come to the US. Now, I don’t want to sound dismissive. Of course, I understand the value of oral histories transmitted in families, and I can see in the history of a country like the United States, shaped so heavily by immigration, the reason for a hunger for genealogical knowledge. Nevertheless, I cannot but feel a slight discomfort when dealing with such ancestral stories. One of my most memorable exchanges happened just last year, while I stood at the counter of a grocery store in Mount Pleasant. My accent had peaked the interest of the guy next to me in line, and he was overjoyed to hear that I was indeed German, like him, as he told me. In fact, he explained, his family had traced his direct ancestry to one of the people traveling on the Mayflower! 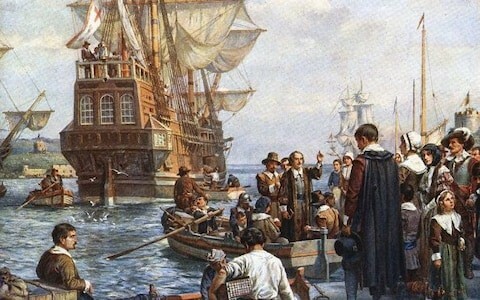 Of course, I was a bit sceptical, considering that the Mayflower Puritans were mostly English. I did not want to be pedantic, so I let him tell me his story, paid, and left the store. Identity is a complicated and sensitive matter, and he was surely entitled to decide his own. However, the encounter remained with me, if only for the strange mix of self-declared German and Mayflower ancestry. For one, if the ancestor he identifies most with was on the Mayflower, why did he immediately emphasize his being German with me? How did the English Mayflower ancestor and “Germanness” correlate (let alone the fact that in 1620, there was no Germany in sight)? And above all, and that is really the subject of this post, what were his other 65,535 ancestors doing in 1620? What emerges, is a simple problem of mathematics. If one assumes a generation to be around 25 years, then someone born into my generation is 16 generations removed from someone old enough to have been on the Mayflower. In general, anyone alive today would be directly descendant from a total of 131,072 people alive since 1590. Since that does not count siblings, cousins, and their respective relations, the grand total of relatives each one of us must have over the course of only the last four hundred years should be roughly around 400,000. (I admit, this is only my lazy estimation.) Thus, only considering ancestors alive in 1620, besides his ancestor of Mayflower fame, our friend from earlier could be proud of 65,535 other people. Some of them lived probably all over Europe, in Sweden and Finland (many of whom came to Michigan in the 19th century), in France and Italy, Poland, Russia, North Africa, Asia, and Great Britain. (Again, this is based on my lazy generalization. If I would speculate based on historical movements this post would be a small book.) A good amount of his ancestors in 1620 were most likely living across North America. Arguably, the great majority of his ancestors must have been poor, some were rich, a few of some fame. Some might have died in debtors’ prisons in England, some of the plague, some of the ague in Michigan. Some might have been Moravians, some Jewish, maybe some were Muslims, and some believed in non-Abrahamic religions. Perhaps one of his ancestors really came with the Mayflower. Looking at these numbers, one cannot but feel overwhelmed – and confused. After all, we cannot possibly all have 65,536 ancestors in 1620, as the total number of original ancestors would be larger than the number of people who ever lived on this planet. The consequence is simple: At some point in time, the chances are high that we are all related somehow. That one nameless ancestor from the Mayflower likely features in the family trees of millions of Americans alive today – people who would identify as Anglo-Saxon, Hispanic, African American, Native American, Asian American, and more. Ultimately, one ancestor in 1620 is nothing compared to the people we are today. While it is surely fascinating to know that someone of our blood line did great things, it is also important to remember that all of us come from a rather small number of Homo Sapiens about 350,000 years ago. Disclaimer: As my worried fifth grade teacher can confirm, math is not my strong suit. I have assumed the average duration of 25 years for one generation. Others have used 30 years or 32 years. If I would change my earlier example according to these calculations, the number of direct ancestors in 1620 is quite a bit lower. However, since I haven’t counted the people related to my grocery store friend in 1620 (as in cousins, siblings of ancestors, and their offspring), I believe I have used fair numbers. If I did make a mistake, please let me know (or comment below).